In medieval European legend, the paladins were 12 brave knights who were loyal followers of Charlemagne, the king of the Franks and founder of the Holy Roman Empire. The name paladin —from a word meaning a person attached to the court—implies that the knights may have resided at the royal palace. The paladins appear primarily in a series of legends surrounding Charlemagne, his adventures, and the history of the Frankish kingdom. 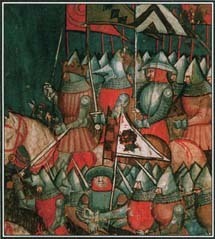 Many were said to play important roles in the Crusades and battles against the Muslims. Among the most famous works in which some of the paladins appear is the Chanson de Roland (Song of Roland), a French poem written in the 1000s. A number of paladins also appear in Italian legends, though under slightly different names. Perhaps the most famous paladin was Roland, the nephew of Charlemagne and main character in the Chanson de Roland. The other paladins included Roland's cousin, Rinaldo of Montalban; Namo, the duke of Bavaria; Salomon, the king of Brittany; Astolpho, an English duke; Fierambras, son of the king of Spain; Turpin, an archbishop; Ogier, a Danish prince; Florismart, a friend of Roland; Malagig, a magician; Olivier, a close friend of Roland; and Ganelon, a Frankish count who eventually betrayed the other paladins and became their enemy. See also Charlemagne ; Heroes ; Roland . The paladins, 12 brave knights who served King Charlemagne, appear in many medieval legends.